Tomatoes are magic, and it is impossible to have too many. Someday I will have too many, but it has never happened yet no matter how hard we've tried. We eat them fresh, we eat them cooked, they can garnish, add to, enhance almost as many dishes as garlic. Almost as many. 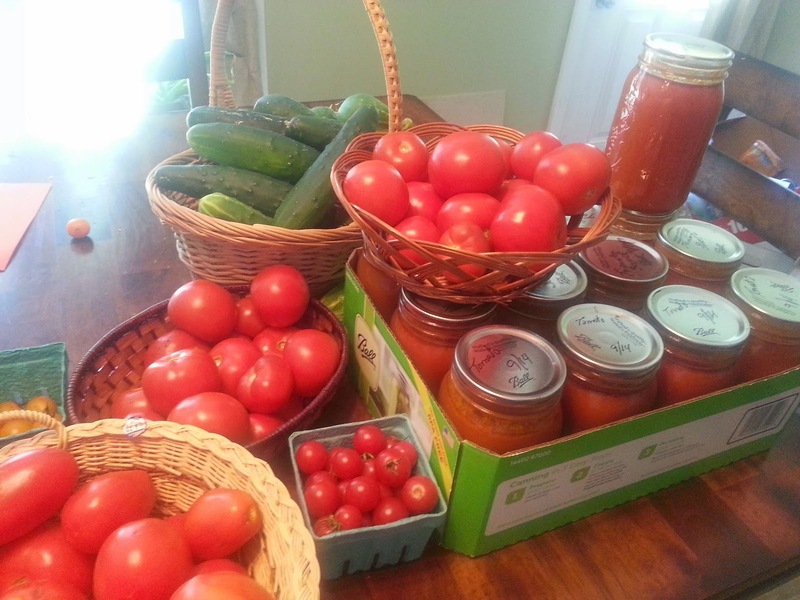 Our mainstay of course is the family recipe for tomato sauce. One thing you learn very quickly when trying to reduce expenses with a garden is just how few of the veggies most people are growing will last beyond the ready-to-pick stage. Some of the squashes and tubers might store a bit under the right conditions but those greens, fruits, berries and the like won't last long without a little help. Luckily such things are very easy to learn, well documented both in books and online and only get easier and faster with practice. Food mill, sometimes called a "ricer" or many other names. 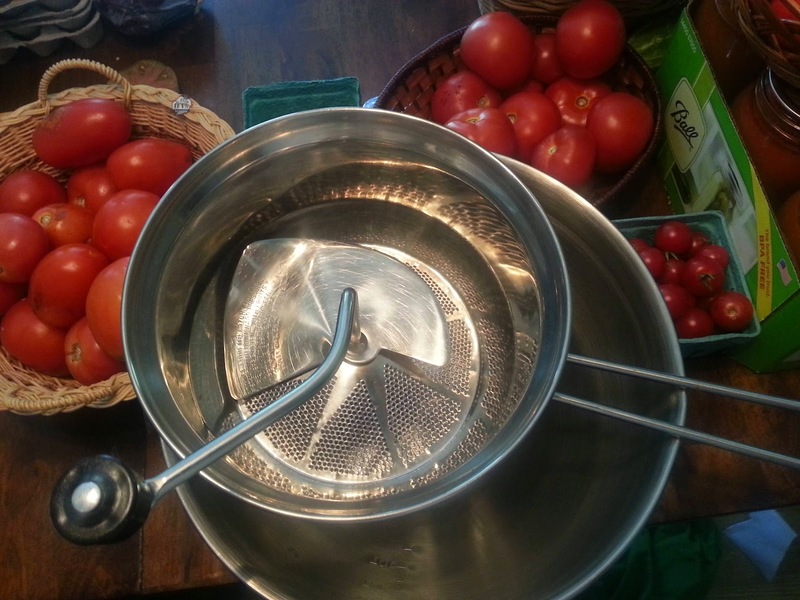 (Optional) Pulverize tomato quarters in the blender (we use a Ninja). In a sauce pot of suitable size, heat 2 oz. olive oil. Add quarters (or slurry) to pot until full. When ready, begin running through your food mill. 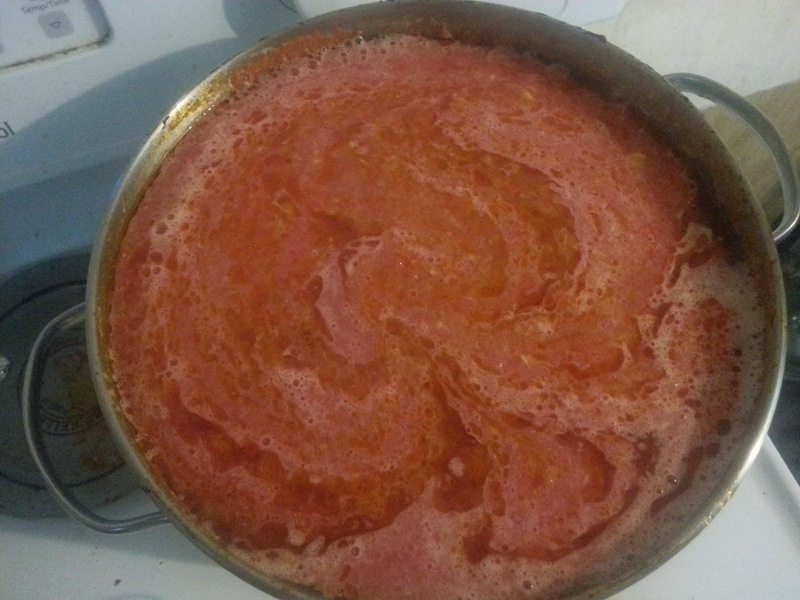 The resulting pulp and seed free sauce can be further reduced if desired or canned as is. 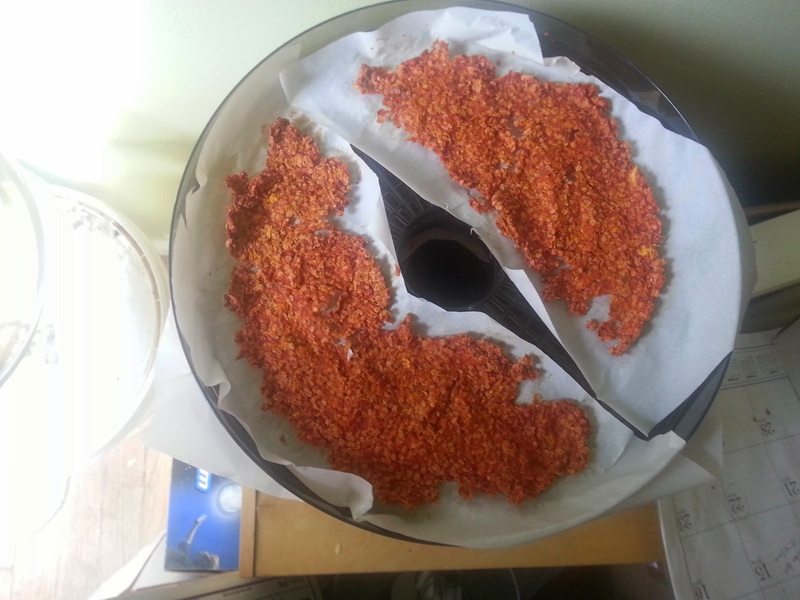 Dehydrated, ready to crumble and store. If you're not yet familiar with canning, the Ball Blue Book is a great introductory resource and one we have used for years. If there is interest, I can go into more depth on what and how we can and why I think you should also, let me know in comments. So the end result from an hour of work are these beautiful quarts of tomato sauce, a large quantity of dried tomato pulp (great for making paste or powder) and the heady scent of simmering tomatoes for days on end. Eventually the tomatoes will be done and I'll move on to other crops, but until then I will enjoy every minute of this. It just doesn't feel like home without a pot of sauce on the stove. Yummy! Those will taste great in the wintertime. I'm getting ready to can sweet corn, pickles and green beans.